21st-century global environment demands that good governance and development must be incorporated in security strategies. How and when can the security sector shift from mere affording physical protection to the long-term benefits of human security and development needs? In this VantagePoints piece, James Creighton, a former commander of Combined Team Uruzgan and Chief of Plans for the International Security Assistance Force (ISAF) in Afghanistan shares how the interconnected challenges of governance, development, and security require significant integration within and among partners and stakeholders. Mr. Creighton served as a commissioned officer in the United States Army for 30 years. As a military officer in the United States Army, when did you first engage with issues of development? In January 1997, I was based in Honduras where the United States has a joint military base. We were responsible for maintaining security within Central America that we do largely through development efforts. We built a 10-kilometer road in Belize. We provided medical treatment to people in Honduras, El Salvador, and Nicaragua. Throughout Central America, we coordinated response to natural disasters. We held exercises in El Salvador and Guatemala. What if an earthquake or hurricane occurs? How would they respond? What are the available resources to respond? What are the critical needs? How do you get those critical needs in areas? Oftentimes, we were able to provide fresh water. We were able to provide immediate medical care, helicopter transportation, and communications to outlying areas. A year later, in April 1998, a hurricane hit and it was the exact same model we exercised. All the things we practiced were executed. The people knew who to call and where to go. Until now, we have people down there doing the same types of things. Operation Omid was described as a comprehensive campaign plan as it established civil-military coordination, how do you see development-security interacting? 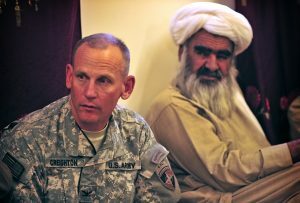 I got to Afghanistan in June 2009, and back then I was the Chief of Plans for General David Rodriguez and General Stanley McChrystal. In that capacity, I wrote many plans but three were major ones. I wrote Operation Omid (Hope), which was basically the defense of Afghanistan given the surge of operations that occurred in 2009-2010. How do you go from 60,000 to 150,000 people? Where do you put the additional people? How do you identify and allocate resources against specific priorities? One of the things in the plan was to write a civilian-military campaign strategy. I wrote a plan that integrated both civilian and military capabilities at the ISAF level in Afghanistan. In that process, I briefed everyone at the 40 embassies. I talked to the International Committee of the Red Cross, United Nations, and other non-government organizations (NGOs) that were involved in Afghanistan. In August 2009, the Dutch decided to leave Uruzgan and they were going to depart on 1 August 2010. The province was where the former house of Taliban leader Mullah Omar was located and was also one of the bases of support for President Karzai. It was paramount that we do not abandon it. With the departure of 3,600 Dutch soldiers, we knew we had to fill the gap. Accordingly, I wrote the exit plan for the Dutch, which was approved in May 2010. “That’s a great plan, why don’t you stay for another year and execute it?” My boss said. In August 2010, I took command of Combined Team Uruzgan, which was composed of forces from 10 different countries to support reconstruction efforts. The Provincial Reconstruction Team was headed by an Australian under my direction. I was tasked to integrate civilian and military power. We were deeply involved with the development efforts such as the elections, schools, clinics, roads, jails, sewage system, and lighting for the streets, among others. We provided resources for almond processing, saffron growing, agricultural assistance, job training, and dozens of other programs that we used to help build capacity. We had three basic lines of operation: governance, development, and security. How do you help build the government to earn the people’s trust, especially when the Minister of Education was seen abusing a child, the governor had been fired because of incompetence, or the police chief was corrupt? The engineer was a good guy but he was not aggressive. You have to resolve these different personalities. The idea was to meet with the government officials of Uruzgan on a regular basis. Although I helped secure the governor’s trips to the districts and villages, I did not lead the meetings. The people want to talk to me but I would generally refer them to the governor and let him take credit and be the one in charge. The crucial thing was that it was not us defining their priorities, but them defining their priorities and understanding the nuances from a cultural perspective. We helped from behind so that they could achieve their priorities so they, for the most part, would be seen as the ones taking care of the people. All we were doing was facilitating that opportunity for them. In a nutshell, that was how the priorities were set in terms of governance, development, and security – recognizing fully that you could not have one without the other. In your time as Commander of the Combined Team Uruzgan, what were the gains achieved and how did these impact the communities? Let me put it in perspective. When I got there, it took four hours to travel 30 miles from Tarin Kowt to Deh Rawod. When I left, it took about 30 minutes. It took 22 hours during a combat operation with dozens of vehicles to travel 163 kilometers from Tarin Kowt to Kandahar. By the time I left, it took only four hours of standard operation (non-combat operation) to travel the same route. The first thing we did was open up the lines of transportation and communication. We built a 42-kilometer tarmac and asphalt road, complete with a double yellow line, from Tarinkot to Chora that cutback travel time from four hours down to 20 minutes. Opening that road changed the dynamic for outer villages. The first time I went to the districts of Gizab, Shahidi Hassas, and Deh Rawod there were no goods and bazaars, the stores were empty, and there were no vendors. By the time my mission ended, the stalls were full. They had solar powers, generators, and fabrics. You name it, they have it. It was like Walmart. It went from 2-3 trucks a day to up to 80 trucks a day passing along these roads going back and forth. Opening up the roads expanded commerce by allowing food and supplies to get in making it more enticing for teachers to come back, clinics to operate, and life to resume to a more normal state. Another example was the change we saw when traveling to Gizab, which is about 100 miles north of Tarin Kowt. Once traveling back at night we decided to fly and it was a 45-minute flight of just pitch black. But when I came back after improvements have been put in place, lights could be seen on the hillsides and the valleys. Solar powers and generators were now available for the population. The downtown area had street lights, paved roads, and drainage. At the time when there was no drainage; a quagmire especially during flood season. They now had schools which actually have books and teachers. It was a more secure and developed environment, and the governance had improved. Typically, when folks would come to ISAF headquarters with General David Petraeus, he would use the Uruzgan briefing as an example of how to get things done. Those are facts from the ground. It is not about me; rather it is about enabling the governor to be able to make things happen. What were the lessons learned? What could have been done better to sustain the progress and growth? To me, the biggest lesson is its fragility. All these things I am talking about are gone now. We were not able to sustain the effort and help the Afghan people to overcome two generations of war. A lot of the places we have secured and have seen tremendous strides, we were not able to carry through. When I was there in 2003, it was a small force of about 6,000-7,000 people and we knew were fighting Al Qaeda. Then we defeated the Taliban. I think when we invaded Iraq and shifted resources there from Afghanistan, we allowed the Taliban to come back in. That was a big mistake. We did not have the resources to do both properly. We spent a lot more resources in Iraq than we did in Afghanistan. Therefore, our efforts in Afghanistan were not as effective as they could have been. But I also believe the Afghan government has been given every opportunity to succeed in so many different ways and they have failed to do so. For me, that was a big frustration knowing how many resources, blood, sweat and genuine desire to make things better have been squandered. That is frustrating. I recognize it is a difficult environment; it is hard to get things done. But they were given the opportunity and failed to take advantage of it. Second, that it takes civilian and military cooperation. That is not always easy because you have different cultures, different priorities, and different views of how things should be and how to get there. It takes compromise from both sides to make that happen. Sometimes parties are more willing to compromise, and figuring out how to do that is critical. In terms of resource management, how do you see that being dealt with, then and now, especially with shifting security strategies and priorities? There are fewer resources now. There used to be 150,000 troops, but it has gone down to 14,000 troops. Development money went away as well. We basically told the Afghans, they had to figure this out, since we had given them as much as we were going to give them. I talk to General John Nicholson, the current Commander in Afghanistan, on a regular basis. His perspective is much more positive than that of the news media. When I read the news, I temper my thoughts on what the media is saying because I know that they are probably just getting 25% accurate and 75% of some sort of political message that they want to get across. It is still difficult. There is ISIS there, although not as active as the Taliban. We will see how the peace process makes out. There were some signs of optimism the last time I was there which was about five months ago. The negative reporting and attacks have to be tempered by the knowledge that education, infrastructure, governance, healthcare and other social services have improved dramatically. There is no silver bullet that will make Afghanistan a progressive country. 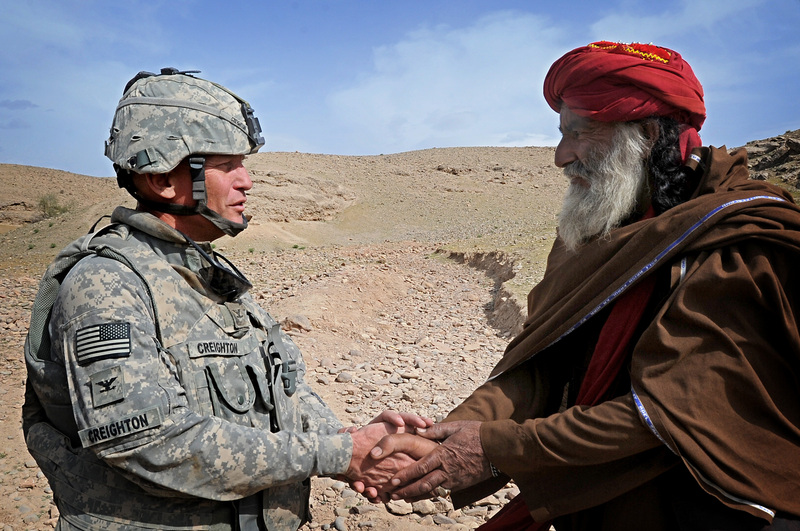 Hard work, patience, and dedication are needed to help Afghanistan continue to improve. Bottom line is that it has improved dramatically and is continuing to improve at a much slower pace than we would like but never the less it is much better now than it was when we started. Having served in the United States Army for three decades, what value did you bring working in a non-military environment such as a think tank? The first thing is leadership and understanding how to organize things effectively. Over and above that, it always helps to have on the ground experience in these different places. Having served two years in Korea, three years in Afghanistan and Iraq, six to seven years in Europe, and a year in Central America, my understanding of the different situations and issues was more from on the ground than academic perspectives. Biggest concerns in my mind are the significant amount of unemployment, resource shortage resulting in conflict based on the distribution of wealth and distribution resources. Those nations with the greatest resources have populations that they can sustain. Those nations with the least resources have huge population bulges, low education, and with the increase in communication, they understand that they are disaffected and behind the rest of the world. That causes more resentment than there has been in the past. From a resource demographic perspective, I think those are where some of the greatest conflicts are going to occur. In reality, we live in a relative time of peace. Despite the ongoing significant issues around the world – environmental, terrorism, or trade, there are organizations, protocols, and nations who are willing to work together. These nations are cooperating at a greater level than ever in the history of the world. That gives me cause for hope. 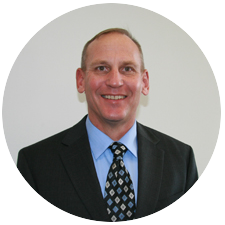 James Creighton is the Chief Executive Officer for Eagle Point Global Solutions, LLC. He has coordinated and executed high-level discussions in Russia, China, Pakistan, India, Afghanistan, Turkey, Berlin, Belgium and many other locations which have focused on developing locally derived practical solutions to difficult problems. Jim served as the Chief Operating Officer for the EastWest Institute for four years, two of which included performing the duties of the Chief Executive Officer. He retired as a Colonel from the United States Army after 30 years of service where he held key command positions. He graduated from the United States Military Academy and has Masters Degrees from Central Michigan University, the Marine Corps University, and the National Defense University. He is a lifetime member of the Council on Foreign Relations. No Replies to "Basic Lines of Operation: Governance, Development and Security"